Well hello everybody! 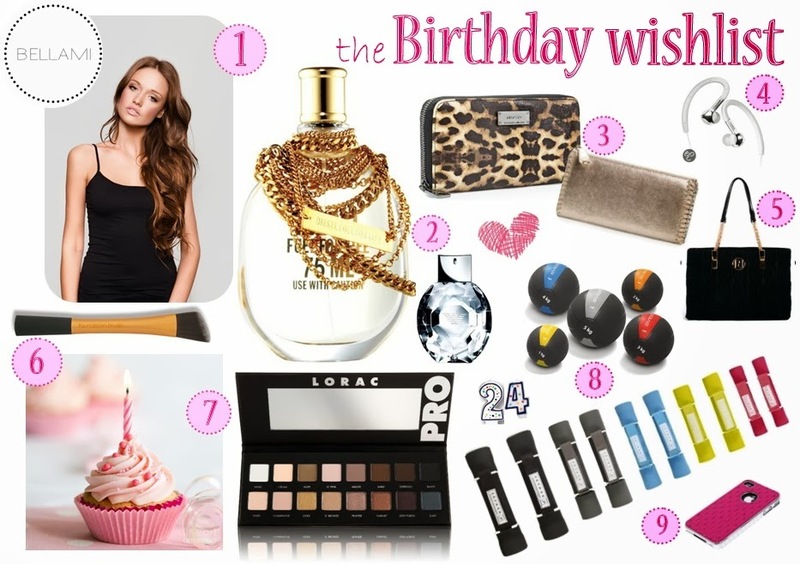 Today I'm sharing my Birthday Wishlist of the year. Maybe you'll even find some things you want to receive yourself. Or if you're birthday isn't coming up anytime soon, you can get some inspiration for Christmas presents! So next week I'm turning 24! Woohoooow, so excited!! I'm going to celebrate the entire week, go out for dinner, party, drink, eat,... but, wait a minute... I'm getting old!! I can't believe I'm already turning 24... On the inside I still feel like a sixteen year old goofy childish girl, that laughs at dirty words and friends who fall down on their drunken a**es ! I also still love Spongebob Squarepants, all things glitter, Britney Spears and pink stuff. I bet you're dyyyying to see what's on my wishlist after knowing this, so let's take a look! 1. Bellami Hair Extensions - 160 grams, 20 inches in chestnut brown: I have heard and read so many great things about these hair extensions. All the beauty gurus are talking about Bellami and they're all very excited about them. It makes me really want to try these out myself! The chestnut brown ones look very rich and warm in color, which always compliments my skin tone. I know there are also 22 inch ones, but I think they're a bit too long for my taste. I love long hair, but it has to be manageable for me, otherwise I feel like the hair drags me down and makes me look short! 2. Perfume - Diesel Fuel for Life and Diamonds Armani: These fragrances are pictured above in the list, but I also love Miss Dior and Light Blue D&G. A fragrance is always a great gift for a girl, who doesn't love to smell nice, right? 3. Wallet - Mango: My current wallet is two years old and it looks like that as well! I currently have a white shiny leather one, but it does not look that white or shiny anymore. I found the wallets above at Mango and love how they look. I'm a fan of long wallets and these leopard and metallic ones look very trendy and totally my style! 4. Headphones In Ear - JVC HA-EBX86-W White: I really need new headphones since my current pair of Apple don't work properly anymore. I also want headphones that go around your ears, so they stay put during workouts. 5. Black Bag River Island - ASOS: This bag from River Island looks so stylish and sophisticated. I came across it on ASOS and fell in love instantly. A new black bag would be very welcome for winter season since it goes with, almost, anything. 6. Real Techniques Core Collection Makeup Brushes: These brushes are used very often in beauty YouTube videos. I looked into them and read many good reviews. They are animal friendly, good quality and aren't even that expensive. This Core Collection consists out of four brushes and would be a perfect basic starters kit. 7. Lorac Pro Palette: Stephanie (smlx0) talked about this palette in her latest videos and was very fond of it. The shades are very pigmented and consist out of a row matte and a row shimmery colors. It's a perfect basic palette with neutral, earthy tones. Since I love wearing my eye makeup natural, this is definitely a "we wants it, we needs it" kind of gift! The only downside is that I haven't found a website that ships these to Belgium... Does anyone has a suggestion? 8. Medicine Ball & Weights - Decathlon: The fitness freak in me doesn't pass up the chance to get some new gym gear. I want to expand my home gym collection so I can work out at home on the days my gym is closed. This medicine ball and these weights from Decathlon are ideal for toning up my arms and for using during squats. 9. iPhone Case: I've had my current iPhone case exactly one year now, I got a transparent one with white and pink rhinestones from my sister for my 23th birthday. This year I want to stay in the girly pink trend, but I want it to stand out a bit more! This flashy fuchsia pink will do the trick! I'm excited and *hopeful* to receive some of the items on my list. If not I'm sure my family and friends will come up with great gifts themselves. The most important part of the day will be the eating, drinking and partying side!